See how EverLast Garage Panels can transform your garage! Is you garage damaged from years of use? Is it too cold when you try to use it during the winter? If these problems sound familiar, EverLast Garage Wall Panels are the solution you need. Everlast panels are a durable solution that's designed to last in a garage while providing a bright and beautiful finished appearance. If you're interested in upgrading your garage walls, the local experts at New England Total Basement Finishing are here to help! We provide free estimates on EverLast Garage Wall Panel installation in Boston, Quincy, Brookline and nearby, and we can help you get the right solution for your home. Call us today at 1-855-229-7059 or click below to get started! 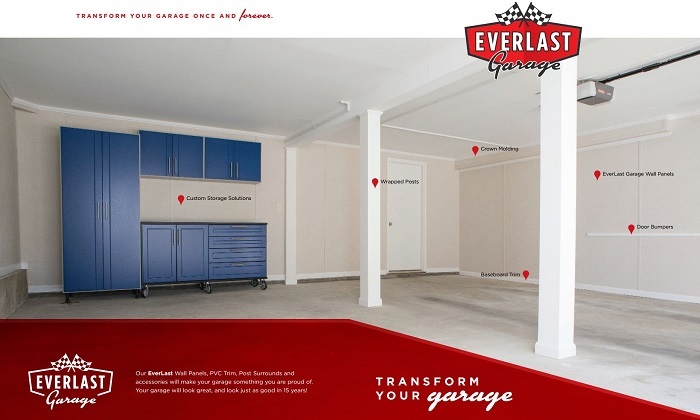 The Everlast Garage Finishing System provides a complete solution that includes storage, finishing touches, optional insulation and more (click to enlarge). Durability: Let's face it: drywall is a soft material that dents easily, hardly making it ideal for a garage. Drywall also can't be cleaned easily and is a prime source of mold growth, which is problematic given how much moisture garages are exposed to. EverLast Garage Wall Panels provide the perfect solution to these problems. These panels are made from a tough cement board that contains no organic material, meaning the boards are difficult to dent and won't ever support mold growth. EverLast panels are finished with a clean vinyl surface that's easily washable, allowing you to even hose your garage walls down if you want! Appearance: Garages are exposed to all kinds of dings, dents, scuff marks and other aesthetic damage. Drywall is difficult to clean without damaging, and frequently re-painting a garage is something no homeowner wants to do. Installing Everlast Garage Panels will keep your garage looking great for years to come. The durable vinyl finished surface is easy to clean, allowing you to maintain the panel's appearance no matter how many times it's scuffed up. In fact, you can even hose down the walls to clean your garage! Insulation (optional): If your garage is uninsulated, we also offer an insulated EverLast Wall Panel. Garage insulation can have a major impact on your home's comfort and efficiency, and an uninsulated garage will make the rooms next to it noticeably colder in the winter. Many homeowners also use their garages as workshops, and they can become almost unusable during colder months. If your garage needs insulation, choosing insulated EverLast Panels will help to create a more comfortable space in the garage while helping to improve your home's overall energy efficiency. If you're looking for a long lasting solution for your garage walls, EverLast Garage Wall Panels from New England Total Basement Finishing are the solution you need. These panels provide everything you need for your garage, including durability, optional insulation, and a great finished appearance. If you're interested in EverLast Garage Panels for your home, call us today at 1-855-229-7059 or contact us online to get started! We offer free estimates on all our work in Boston, Quincy, Brookline, Cambridge, Newton, Framingham, Taunton, Plymouth, Providence, Pawtucket and throughout the surrounding areas.